Okay. Okay. Everyone is going to have their own favorite or go to, but I didn’t have one I was in love with until about a week and a half ago. I had tried the Seche Vite, but did not like the whole shrinkage thing. Sally is the brand I experimented the most with. I tried the acrylic top coat, which was a great top coat, after waiting seven years for it to dry. Clearly, I use it, since the bottle is about half gone. I will continue to use it until it is all gone. The issue with it is the dry time. Unless you can honestly say you don’t need your hands for about an hour, (longer to be really safe) this isn’t for you. The positives include things like sealing in nail art well, even 3D stuff, and a shine that doesn’t quit. In addition, when this product says “no chip”, it is true. When I use this top coat, I can wear nail polish for seven days easily. That includes hair washing, dishes, you name it. This top coat wasn’t the magic one though. So, I kept looking around. 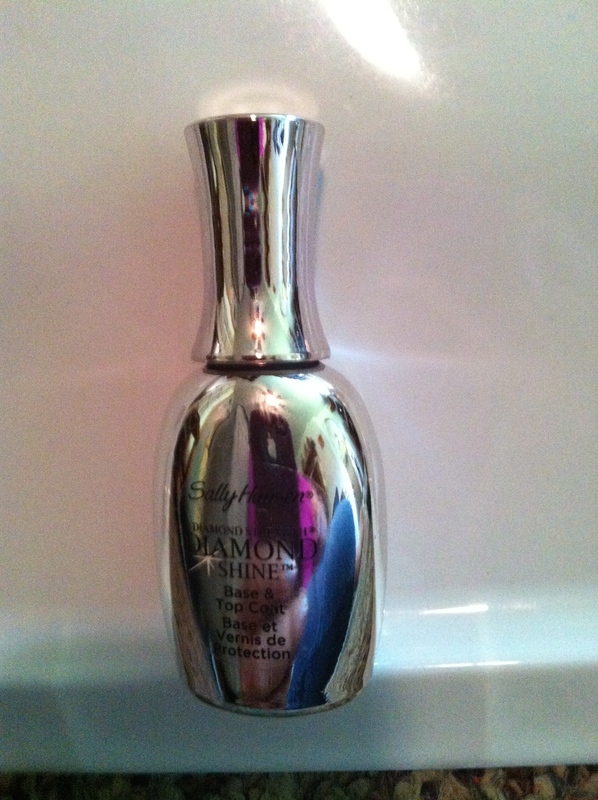 I tried Sally Hansen Diamond Shine. It is a base and top coat, so I guess I figured two birds with one stone. Let’s go. Really, it is a good base and top coat. As far as top coat goes, it does have a brilliant shine. The box says there is diamond dust in it, so maybe that contributes to it. 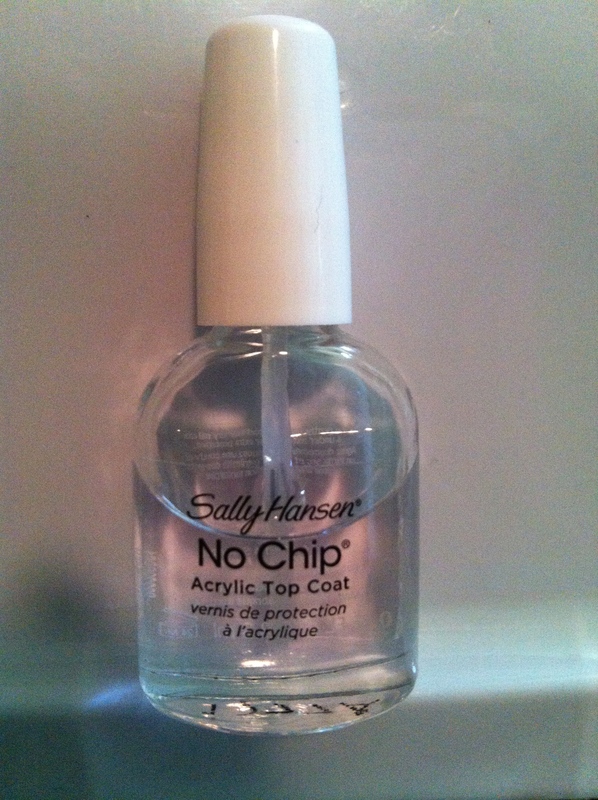 This one is not my favorite for sealing in any type of rhinestone or other nail art. It didn’t hold as securely as the acrylic. It is a lot thinner than the acrylic one though, so applying it was easy. 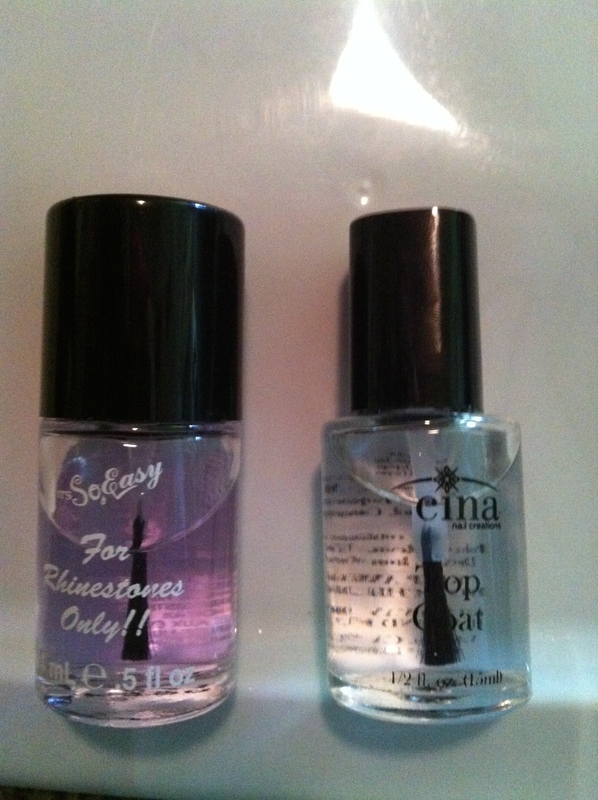 These two top coats I purchased specifically for nail art, and I am not upset about it. The purplish one says for rhinestones only, and is very thick, but boy does it bond the stones! When I use this, those bad boys aren’t coming off until I want them to. The clear one is supposed to be for any other nail art (flowers, bows, feathers, etc.) and it does a great job too. Neither one is something I would use on its own though. I usually go over these top coats with the one for my regularly painted nails, because these don’t have a ton of shine to them. Then, I finally found my dream top coat. It is Sally Hansen Insta Dri. A shine that looks freshly painted from day to to whenever you remove it. (I have worn it up to eight days, no problems.) It dries quickly. It isn’t completely cured out, but if you needed to undo your pants to go to the restroom or something, you’d be good to go about three minutes later. Nails do not chip while using this. I hand wash dishes, type, grade papers, garden, wash my hair, whatever….my nails still look good. It is not terribly thick or thin. (Just right…. *COUGH* *GOLDILOCKS* *COUGH*) It holds nail art on, but since i have the others that are specifically for nail art, I will use them. There wasn’t the shrinkage issue like with the Seche Vite. Also, the Seche loses its shine after a couple days. 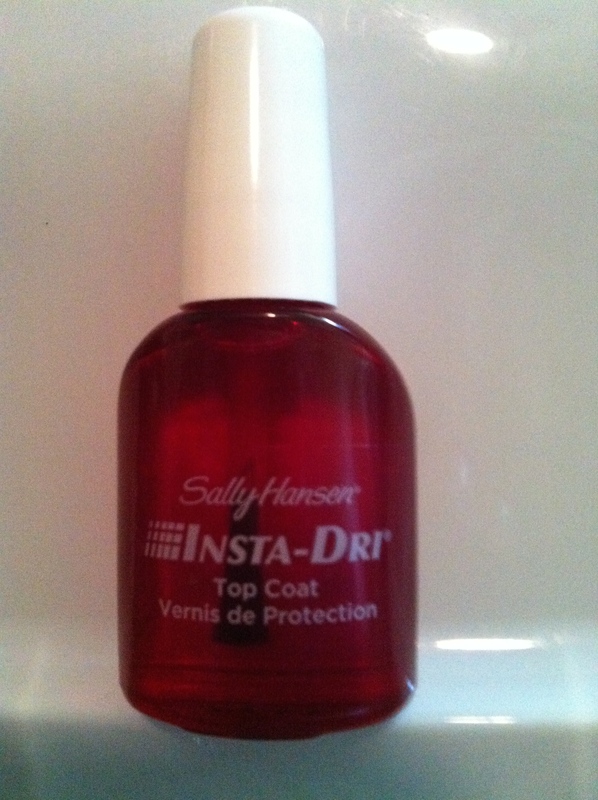 If you are looking for a top coat that dries quickly, shines for days, and seals things in, look for the red bottle. Priced at about $4, it’s worth a try! What’s your favorite? Or, are there any that you would stay away from? Let me know!